There are several all-important contributors to a whiskey’s flavor: mash bill and yeast can certainly make a difference, and the type of wood that the barrel is constructed from makes a major difference, as well as the duration of aging. Char level is another factor, with most bourbons being aged at #3 to #4, or an alligator char. This allows the spirit to extract more vanilla flavors and color from the wood. But it’s climate that really drives the entire process. 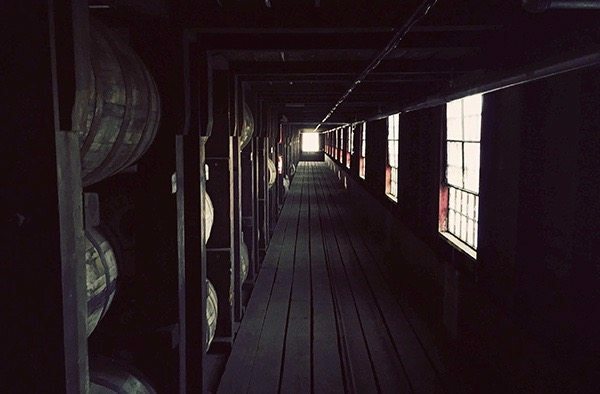 Rickhouses are rarely climate controlled, so the whiskey stored there is at the mercy of the weather. Why does this matter? But external temperature is only part of the equation, because all spots in the rickhouse are not equal. Even within a non-climate controlled structure, there’s a lot of room for variation. The higher racks and spots closest to the walls will be exposed to the greatest amount of temperature variation. Over a relative period of time, they’ll usually absorb more flavor than barrels situated in the interior of the rickhouse.1 Beyond aging our bourbon in a dusty rickhouse, Angel’s Envy has one additional step before we bottle. We finish our bourbon in ruby port wine barrels for up to six additional months. We found that to be the sweet spot for our port finished flavor, and really, it never hurts to spend a little more time in the barrel.